According to this paper, Arctic sea-ice fluctuation is caused by natural solar cycles, not anthropogenic (human caused) global warming. The February issue of the Journal of Quaternary Science, a highly respected paleoclimatology journal, included an article that reported a study of Arctic sea-ice extent over the last 10,000 years in the Chukchi and East Siberian Seas of the Arctic Ocean. The authors are at the University of Bremen in Germany. The chart below is an adaption (in other words, easier to read) of a chart that appeared in the article (and I confirmed that is an accurate adaptation). As you can see below, the extent of Arctic sea-ice in the Chukchi and East Siberian Seas of the Arctic Ocean today is greater than it has been at any time in the last 10,000 years, except for the Little Ice Age, which had temperatures as cold as the last glacial maximum. And it’s just a little below the Little Ice Age ice cover at that. According to the authors, the increase in sea-ice during the late Holocene is a circum-Arctic phenomenon as is demonstrated by other studies around the Arctic. 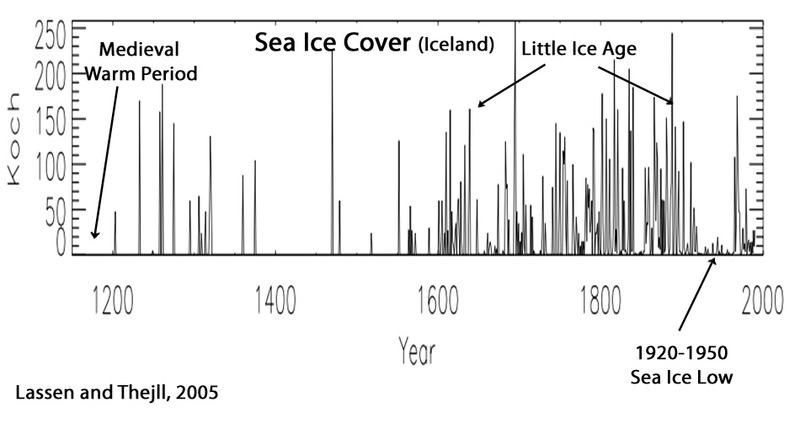 This is a remarkable chart which puts the current sea-ice extent in historical perspective. Stein, R., Fahl, K., Schade, I., Manerung, A., Wassmuth, S., Niessen, F. and Nam, S.-I. (2017), Holocene variability in sea ice cover, primary production, and Pacific-Water inflow and climate change in the Chukchi and East Siberian Seas (Arctic Ocean), Journal of Quaternary Science (February). In a new paper (Stein et al., 2017), scientists find that Arctic sea ice retreat and advance is modulated by variations in solar activity. 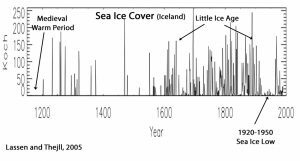 In addition, the sea ice cover during the last century has only slightly retreated from the extent reached during coldest centuries of the Little Ice Age (1600s to 1800s AD), which had the highest sea ice cover of the last 10,000 years and flirted with excursions into year-round sea ice. 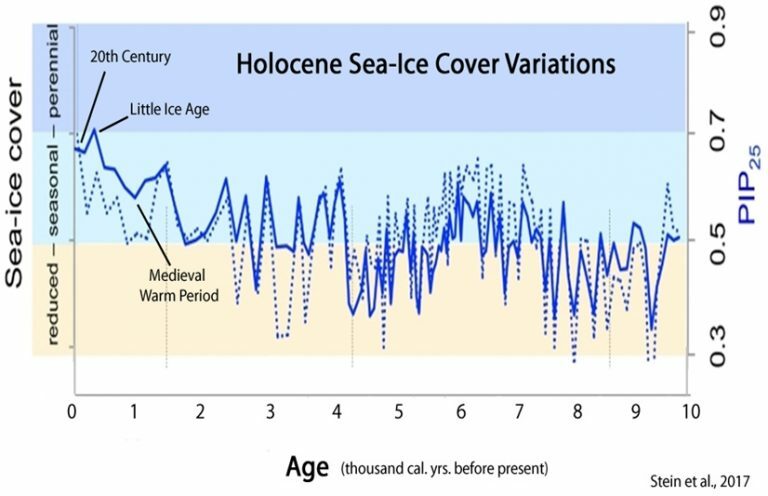 The Medieval Warm Period sea ice record (~900 to 1200 AD) had the lowest coverage since the Roman era ~2,000 years ago. Of note, the paper makes no reference to carbon dioxide or anthropogenic forcing as factors modulating Arctic sea ice. The causes that are controlling the decrease in sea ice are still under discussion. In several studies changes in extent, thickness and drift of Arctic sea ice are related to changes in the overall atmospheric circulation patterns as reflected in the North Atlantic Oscillation (NAO) and Arctic Oscillation (AO). The NAO and AO are influencing changes of the relative position and strength of the two major surface-current systems of the Arctic Ocean. The increase in sea ice extent during the late Holocene seems to be a circum-Arctic phenomenon, coinciding with major glacier advances on Franz Josef Land, Spitsbergen and Scandinavia. The increase in sea ice may have resulted from the continuing cooling trend due to decreased solar insolation and reduced heat flow from the Pacific. The increase in sea ice extent during the late Holocene seems to be a circum-Arctic phenomenon as PIP25-based sea ice records from the Fram Strait, Laptev Sea, East Siberian Sea and Chukchi Sea display a generally quite similar evolution, all coinciding with the decrease in solar radiation. The main factors controlling the millennial variability in sea ice and surface-water productivity are probably changes in surface water and heat flow from the Pacific into the Arctic Ocean as well as the long-term decrease in summer insolation, whereas short-term centennial variability observed in the high-resolution middle Holocene record was possibly triggered by solar forcing. Robust substantiation for the trends documented in this new Arctic sea ice record comes from a 2005 paper by Lassen and Thejll entitled “Multi-decadal variation of the East Greenland Sea- Ice Extent: AD 1500-2000.” Shown below is an annotated graph from the paper revealing Iceland’s sea ice cover during the last millennium. These scientists also link sea ice variations to solar activity, namely solar cycle length. Notice the direct correspondence between the Arctic trends as a whole (from Stein et al., 2017) and the trends for Iceland. [W]e find that the recently reported retreat of the ice in the Greenland Sea may be related to the termination of the so-called Little Ice Age in the early twentieth century. We also look at the approximately 80 year variability of the Koch [sea ice] index and compare it to the similar periodicity found in the solar cycle length, which is a measure of solar activity. A close correlation (R=0.67) of high significance (0.5 % probability of a chance occurrence) is found between the two patterns, suggesting a link from solar activity to the Arctic Ocean climate. The ’low frequency oscillation’ that dominated the ice export through the Fram Strait as well as the extension of the sea-ice in the Greenland Sea and Davis Strait in the twentieth century may therefore be regarded as part of a pattern that has existed through at least four centuries. The pattern is a natural feature, related to varying solar activity. The considerations of the impact of natural sources of variability on arctic ice extent are of relevance for concerns that the current withdrawal of ice may entirely be due to human activity. Apparently, a considerable fraction of the current withdrawal could be a natural occurrence. There is another threat then rising sea levels. If the oceans begins acidifying then we can have another extension episode. Acidifying can happen if too much co2 goes into the ocean. The questing is what increasing co2 levels will mean for our future and if we are willing to take the risk. Scientifically, the books are being cooked to support environmentalist theology. That said, climate seems to be changing, and humans without doubt continue to damage the environment – including in far-West Texas many who claim to be protecting animals and habitat. Carbon (CO2) sequestration or release directly correlates to how we harm or repair these systems. Confucius taught that if every person takes the best possible care of what is under his direct control, society and the world will get better. So I say, let’s stop hurting wildlife and habitat by promoting practices that heal the land and the animals. Doing that will repair the carbon (CO2) cycle which in turn will mitigate global climate change, whatever its root cause. So you believe the rise from 290 to 400 ppm CO2 is all due to land degradation? I do not know the measurements to which you refer. However, whatever changes are occurring, and whatever the reason(s) for those changes, land degradation increases atmospheric carbon. Reversing this land degradation will reduce atmospheric carbon relative to whatever is happening otherwise. 400 ppm(parts per million) is the measurement used to measure the amount of CO2 in the air. It is rising about 2.5-3 ppm a year and passed 400 in 2013. Some say 50% comes from fossil burning and 50% from land and most say 95% comes from fossil burning. My understanding is that globally, an area half the size of the African continent is burned every year. Burning 6-million square miles – 3.8 billion acres – represents 5% of the annual atmospheric carbon additions? More fake science in my opinion. That land burning has been happening for hundreds (thousands) of years as part of primitive agriculture practices. Imagine the ‘legacy carbon’ – ancient atmospheric carbon from past millennia of burning – associated with that. Think of 2,000-years of carbon contained in the statistics you reference. The grassland destruction is releasing as much carbon as the burning. As far as I can tell, this aspect of atmospheric carbon addition is not being considered, nor is the potential for carbon storage associated with good grazing which will lead to restoring the sequestration process. We need to stop the global burning, stop global soil destruction, and again return carbon to the soil in the grasslands – which are the largest terrestrial carbon sump by far. Whatever the trends, the measurements, and their causes, this potential for carbon sequestration is huge and almost wholly ignored by the environmentalists. But plants did sequester that carbon when they grew, so it is adding CO2 to the atmosphere or the oceans, tho I do not agree at all that it is a good way to manage land. Plants will also release co2 when they biological decay, but probably less then rapid oxidized decay when burned. Land burning/land degradation has been happening for the last thousands of years, and that is also why I don’t understand the increase in CO2 in the atmosphere and the oceans first has started taking off the last 40-60 years. I agree with you but on the effects of fossil burning on co2 levels in the atmosphere, I think there is too much obvious data that shows that it is the cause. How the increase in CO2 levels affects the planet I think we can argue. I we really began restoring the soil, I think fossil burning could be acceptable if we also cleaned the air when burning it and didn’t spill it everywhere, just handled it properly. -If* we really began, sorry, not -I we really began.